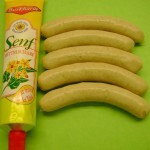 Knackwurst – this short, plump sausage is made with a combination of beef and pork with a unique blend of spices including garlic. They are fully cooked so just simmer to heat or brown on the grill. Makes a great dinner served with sauerkraut and potatoes. 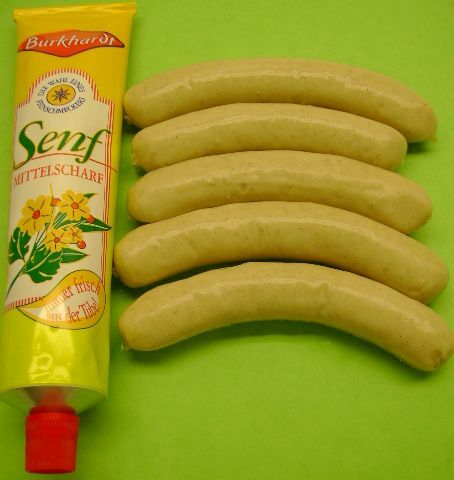 Knackwurst are linked by hand and average 5 links to a pound. $5.49/lb. 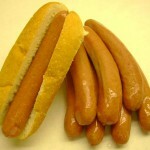 Frankfurters – a pork and beef, natural casing hot dog similar to a Vienna. They are fully cooked so just simmer heat or brown on the grill. Try on a Kern’s Bakery bun for a great taste both young and old will enjoy. Our Franks are linked by hand and average 8 links to a pound. $5.75/lb. 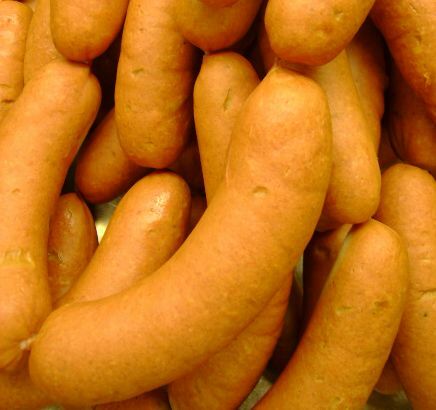 Wedding Franks – made like our Frankfurters only in a larger diameter natural casing. They get their name from being traditionally served at German wedding receptions. Eat cold or heat and serve for a terrific, quick meal. 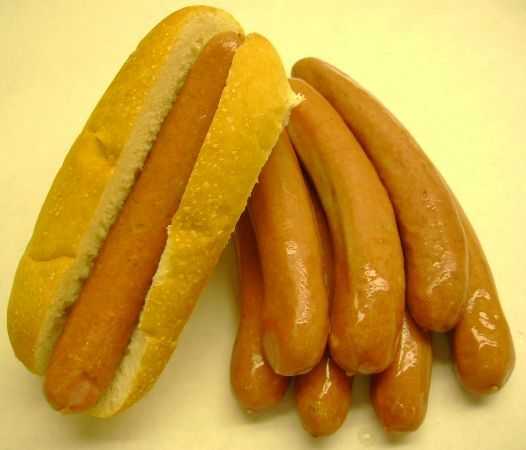 Wedding Franks are hand linked and average 5 links to a pound. $5.49/lb. 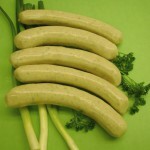 Weiswurst – a veal and pork mixture creates a light and fluffy texture with a mellow nutmeg flavor. 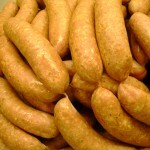 Weiswurst are fully cooked but not smoked contributing to it’s traditional white color. Brown on the grill or in a pan then add a touch of sweet hot mustard is highly recommended. $6.09/lb. Bockwurst – traditionally an Easter time sausage made with a combination of veal and pork. 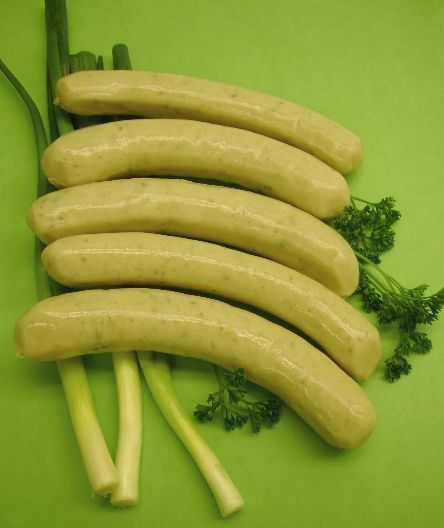 This sausage is seasoned with fresh green onion and parsley. 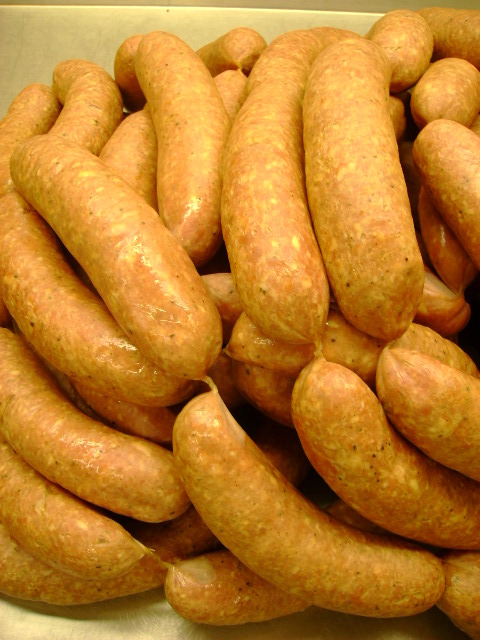 Bockwurst is fully cooked, just brown and serve. $6.09/lb. Click Here to see us making Bockwurst with our new stuffer!